Violence rears its head in Egypt this week as part of the fallout from the US-financed military coup from last month. When we superimpose the (approximate) chart of the coup with this week's planetary positions, we see some apt symbolism. Transiting Jupiter in Cancer is tightly opposite both the Pluto position of the coup and the current Pluto position: people/nation against power. 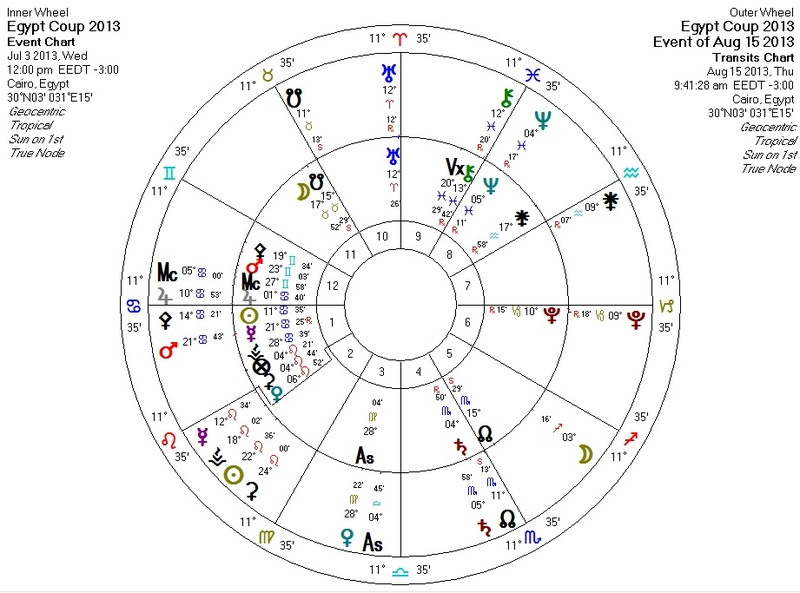 Transiting Mars is conjunct the Mercury position of the coup: violence regarding communication (protest and government crackdown against protest). 1. Pallas is (still) opposite Pluto. 2. Neptune opposite the midpoint of Venus and her ruler Mercury. 3. Pluto quincunx Mercury, ruler of Venus. As libertarians, we support peaceful resolution of the conflict, and condemn the continuation of the US intervention that has cost so many lives in Egypt in recent weeks.